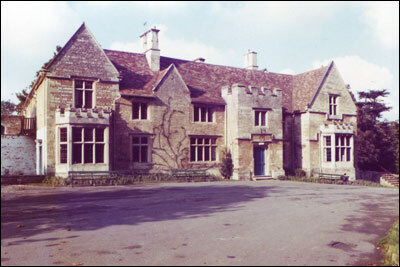 Old Clayton (the gardener) has just told me that he was at Fletcher’s “Sale” at Rushden Hall, that he was about 4 years old then, that he was now 84 (Oct 13 1915). The Hall Estate was put up for sale in 1836 (May 20 from advertisement) and yet Clayton said that John Fletcher did not live at the Hall after Thomas Williams who was there from about 1821 to 1830, according to gravestones in Pemberton Chapel & also to the “Gentleman’s Magazine”. 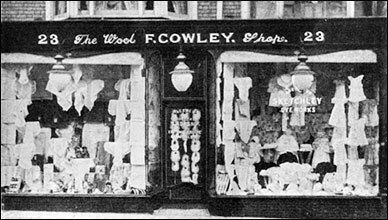 He says that John Fletcher lived at an old house where “Cowley’s Drapery” shop now is, just below Robinson’s corner of Church Street. The old property was bought I think by late Wilkins who had built the present houses only since they have been turned into shop. Clayton would not remember Williams’ Sale (if he had one) if Williams left the Hall about 1830. Clayton says that John Fletcher went to live at Bedford in an “Alms House” when he left Rushden. Clayton says that Mr F U Sartoris bought Estate of Captain Brown, so it seems to me that Captain Brown bought it at the sale in 1836 May 20, because Mrs F U Sartoris told me that Mr Sartoris bought it in 1840. Clayton also says that Mr F U Sartoris went away for about 12 months & that a Mr Currie, an old gentleman, lived there for about 6 months then a friend of Currie’s came for another 6 months. He says that John Fletcher was a big stout man. Clayton says that it was a very cold day at Fletcher’s sale at Rushden Hall, because he remembered a man from Irthlingborough telling him that the "wind blew thro’ him like going thro’ a hurdle". The man’s name was Sam Cuthbert. He told me too (Clayton) that John Robinson was a farmer & lived in Scott’s old house (bottom of the Green) & had the “Knuston Farm”  he lived at Scott’s old house because the Knuston Farm house was not built then. This chat was on the rail top side of Green opposite the Church  a lovely hot, bright, clean morning, Wednesday Oct 13 1915. J E Smith.